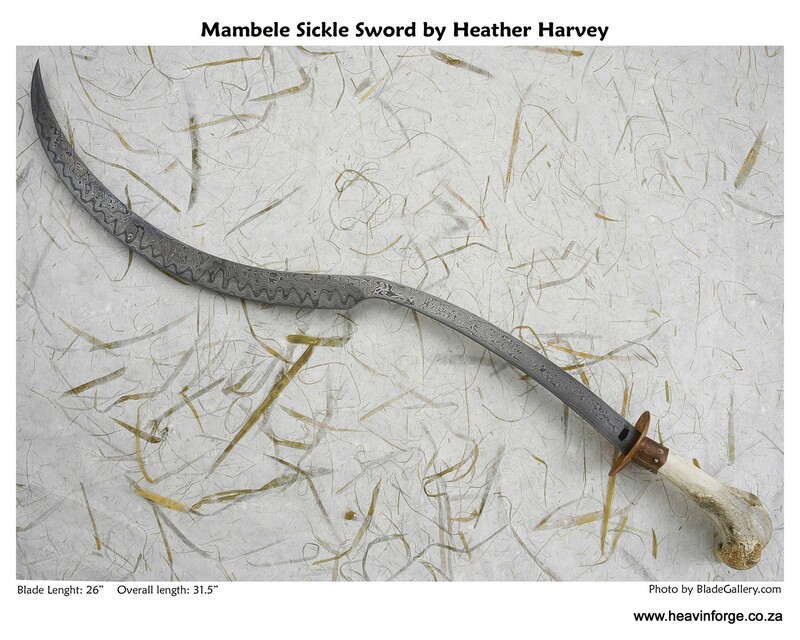 Profile: Due to two permanent injuries to both of my hands, I am no longer able to make knives. I retired from bladesmithing in 2013. I assist Kevin, my husband, in teaching our two-week, ABS approved, Introduction to Bladesmithing course and do all the admin that goes with a bladesmithing business. I was born in Vereeniging, South Africa but grew up in Zimbabwe. I studied at Montana State University Horseshoeing School and qualified as a farrier in 1983 becoming South Africa’s first qualified female farrier and had my own horseshoeing business from the age of 19. Due to an allergy to horses, I then turned to traditional blacksmithing, qualifying with the Metal and Engineering Industries Education and Training Board. I ran the blacksmith shop at the theme park, Gold Reef City, in Johannesburg, South Africa where in 1996, I met Kevin Harvey, now my husband, who ran the knifemaking shop in the same park. I began making Damascus steel in 1995 and started forging knives since in 1997. In 1998 I received the Blade Magazine Scholarship and Kevin and I attended the Bill Moran School of Bladesmithing in Arkansas U.S.A where we did the two-week Introduction to Bladesmithing course and the one week Damascus course. We moved to Belfast, Mpumalanga, South Africa in 2001 where we combined our workshops. I became a Knifemakers' Guild of Southern African member in 2003. 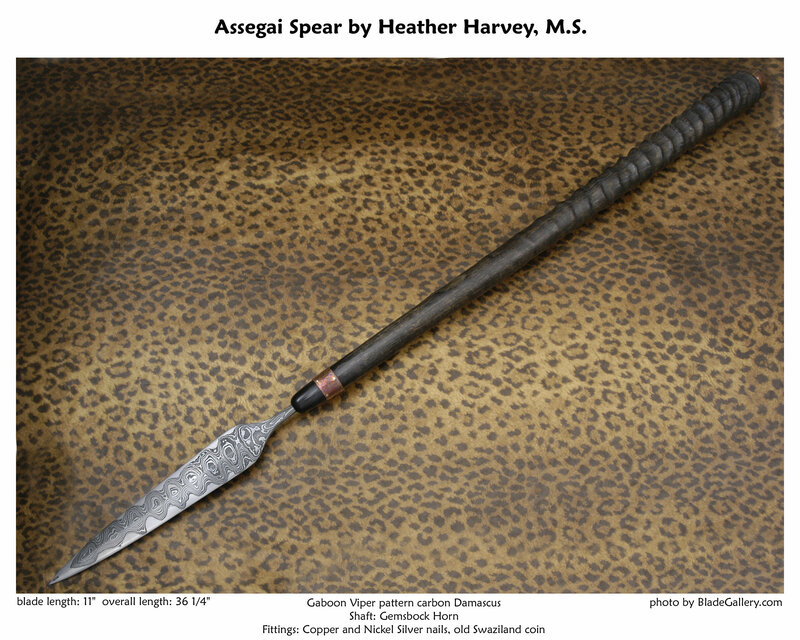 I loved making traditional African weapons and period style knives from my own Damascus steel. I would do all the forging, heat-treatment, embellishment and sheaths. I prefer using natural handle materials. I received my Master Bladesmith rating with the American Bladesmith Society in 2003 becoming the second only female Master in the world. Kevin and I are the second married couple Master Bladesmiths in the world. We used to collaborate on projects under the name Heavin. I normally did all the hot work and Kevin the finishing. Kevin and I are both founder members of the Southern African Bladesmiths Association (SABA) and we also taught the two-week Introduction to Bladesmithing course at the Bill Moran School of Bladesmithing in Arkansas. We often demonstrate at Hammer In's in South Africa and the U.S.A. Highlights of my bladesmithing career are having an assegai (Zulu spear) and Mambele (African Sickle Sword) used on two of Wilbur Smith's book covers. Winning the W.W. Scagel Award and the ABS Chairman's Award along with the Knifemakers' Guild of Southern Africa's Chairman's Award, together with Kevin in 2015, has been the greatest honour. 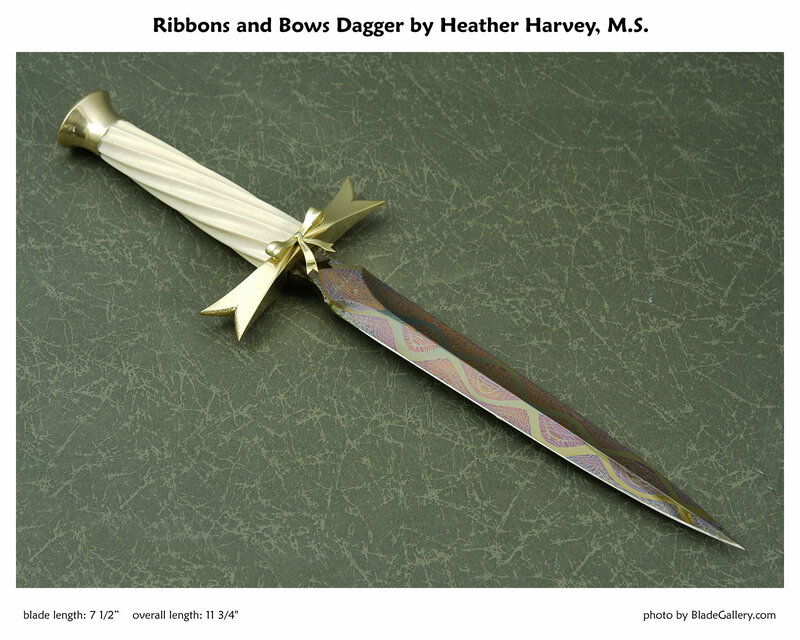 Heathers Turkish Ribbon mosaic damascus with bell metal guard and pommel. 14 kt gold bow. Handle of mammoth ivory. Damascus was hot gun-blued. Sold. 26" blade of Heather's "Winding River" damascus. Guard and ferrule of copper. Handle of Zebra bone. Sold. Heather's "Gaboon Viper" San Mai damascus. Gemsbok horn shaft, fittings of copper. Sold.